It’s time for another Recipe of the Week! 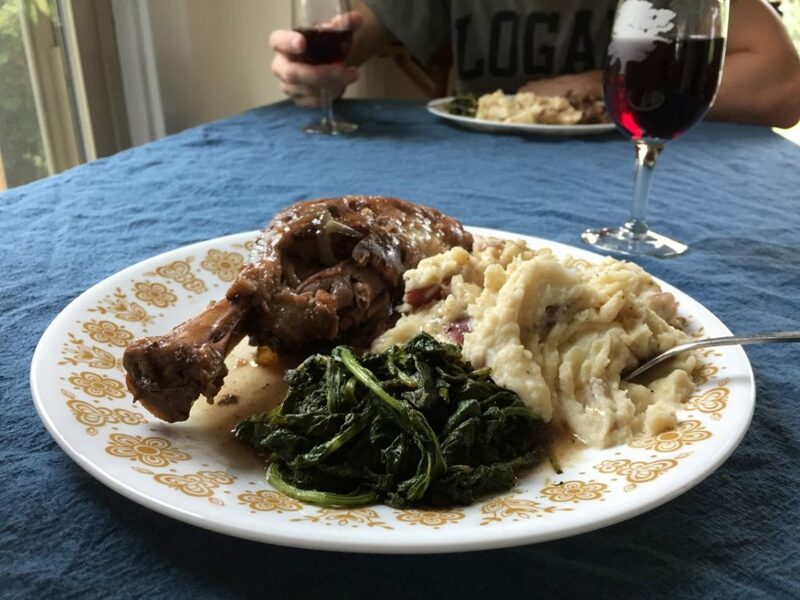 This time, employee Alex gave Slow Cooker Red Wine & Maple Lamb Shanks from Big Oven a try. This one took a while, with an hour of prep and eight hours of cook time. It is the perfect set and forget dinner to impress. Read on to see how it went for Alex and what changes she would make next time. Then, give it a try and let us know in the comments what you would change! Bon Appetit! Hi everyone, Alex here with another Recipe of the Week for all of you! It has been a little while since I did one of these and I’m excited to be back! 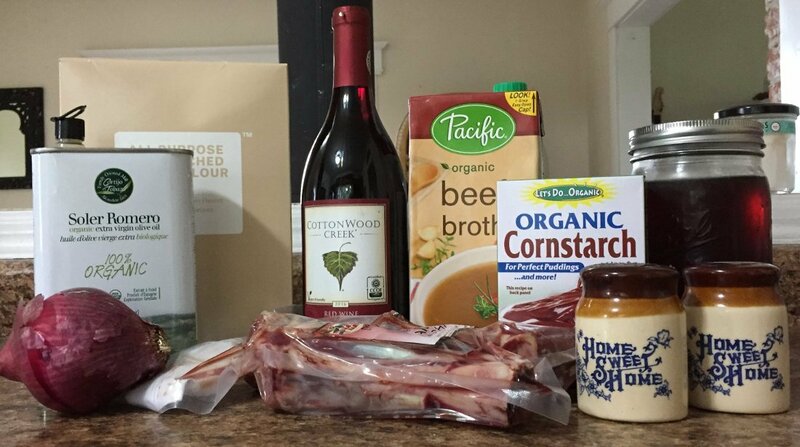 This week I decided to try making Slow Cooker Red Wine & Maple Lamb Shanks from Big Oven. 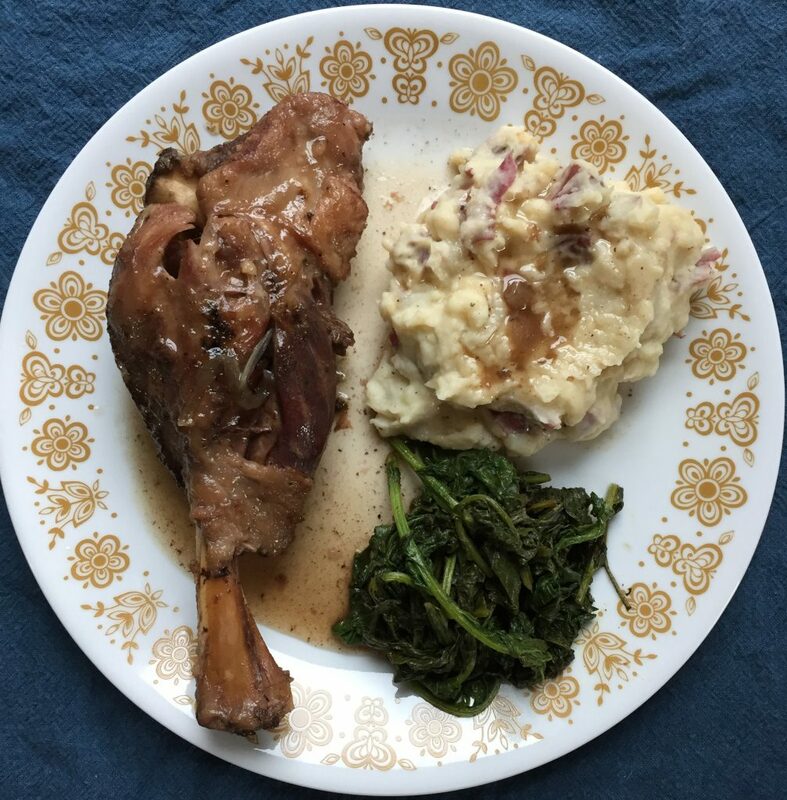 This recipe looked like a delicious and simple savory maple recipe and perfect for the lamb shanks I impulse purchased at the local food coop recently. It was also the perfect recipe for my busy Sunday at home. Let’s dive in! 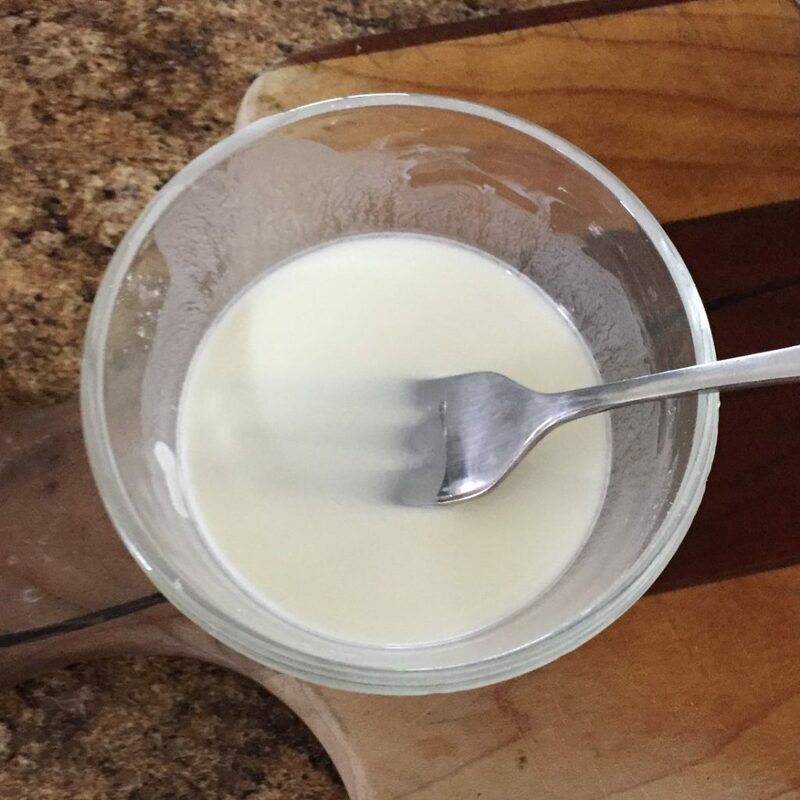 The list of ingredients was pretty simple, I did have to pick up a couple of things at the store, but I think many of these ingredients will already be in most people’s homes. I was excited to be able to find all organic ingredients for this one as that is something I always strive for. The maple syrup I am using here is our Grade A Dark & Robust Organic Maple Syrup. It is in a jar because it fit better in my fridge than a mostly empty gallon jug. Because it takes so long, I started the recipe in the late morning. 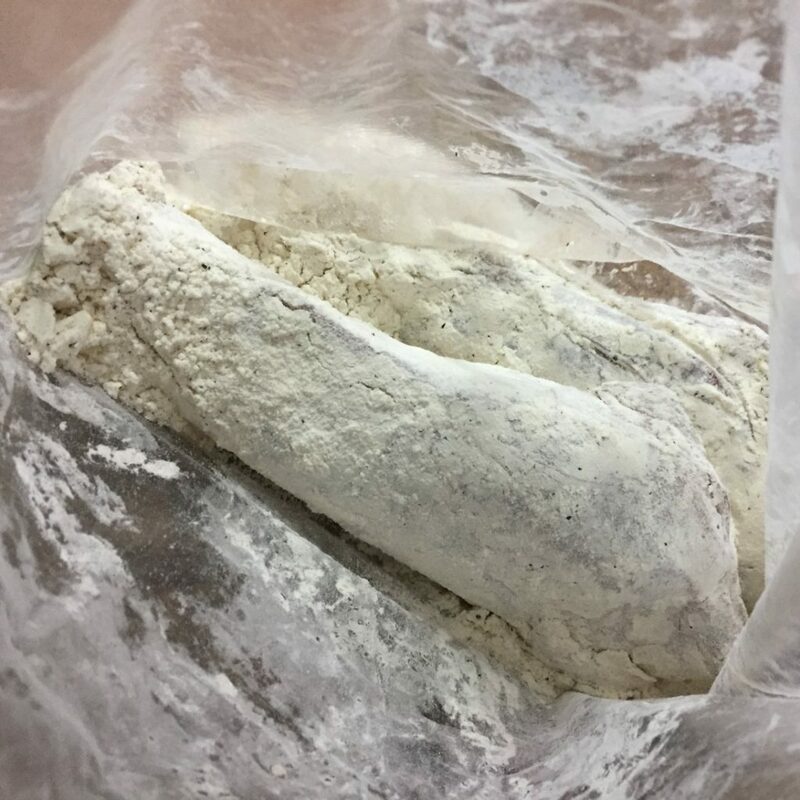 The first step in the recipe involves mixing together flour, salt, & pepper in a plastic Ziploc bag, adding the lamb shanks, and shaking to coat. I used half as much flour as the recipe called for since I only made 2 shanks. I think I could have used even less than that. It didn’t specify how much salt & pepper to use, so I just eyeballed it. If I was to make this again, I would add a lot more than I did. Don’t be afraid to go crazy with both. 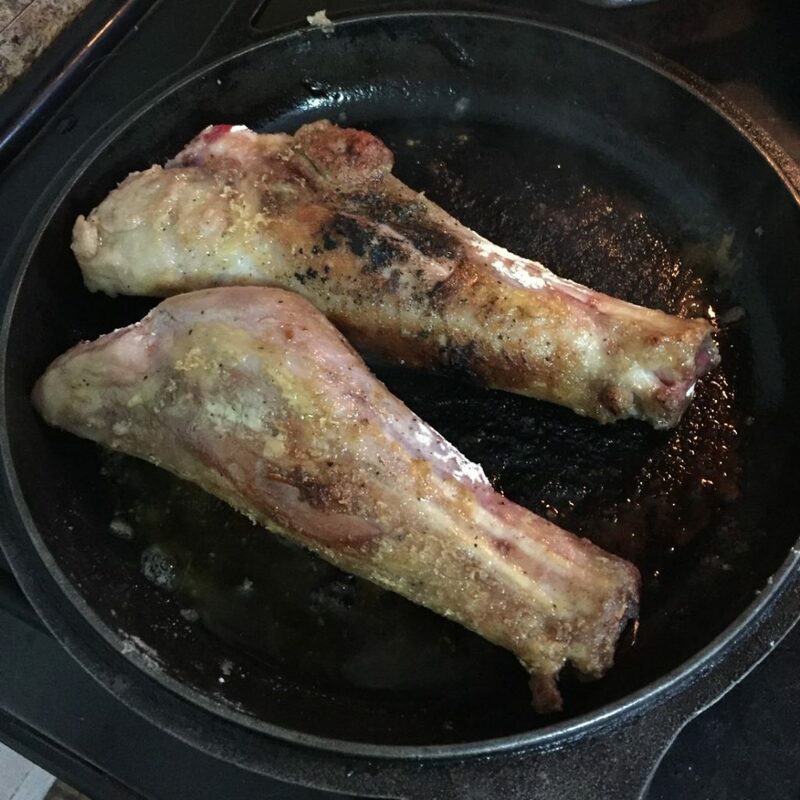 After coating with flour, you should brown the shanks on the stove for a few minutes on all sides. The recipe didn’t specify temp for this part I started off a little too high and ended up getting everything a little bit more burnt than I wanted, but it didn’t end up affecting the final flavor. Once your shanks are browned, you should add them to your slow cooker (or if you are like me, you can just use your Instant Pot). The recipe says to mix the other ingredients (broth, wine, & maple syrup) together before adding them to the pot, but I didn’t do this. I just poured them in one by one and kind of mixed them up with a fork. It didn’t seem to affect the final product. I was going to cut the ingredients for the sauce in half as I had done with the rest of the recipe. 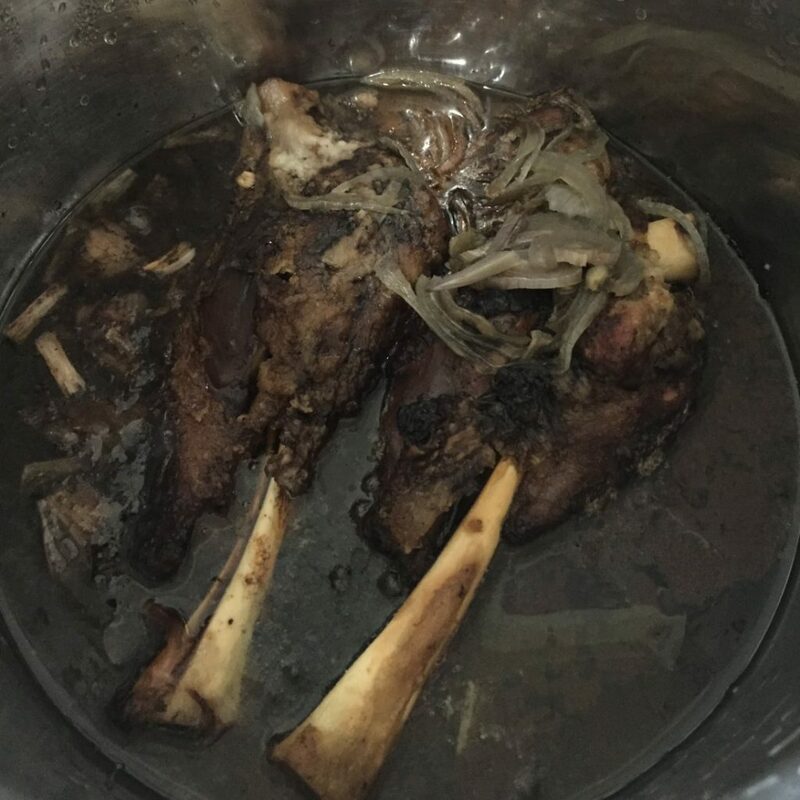 However, when I put the liquids in the pot, I realized it was not enough to cover any of the lamb. So, I decided to go with the amount the recipe called for and just save the leftover sauce for another day. I will note that I did not use any garlic in the recipe because I am allergic to them. I also only used half of my onion because I have an intolerance to onion. If you can, I would recommend using them both. I think it would have added a lot to the final flavor. With the recipe ready to go, I locked the lid into place and set my Instant Pot for 7 hours on slow cooker mode with the air vent open. It was nice to be able to let it cook while I went outside and did some work on the farm. The knowledge that something delicious is being made while you accomplish things around the house is always a bonus. As instructed by the recipe, I carefully removed the lamb from the pot and mixed up some corn starch & water to add to the sauce. I added it and cooked the sauce for another 15 minutes. While that was cooking I shredded one of the lamb shanks for my SO who preferred his that way. I also finished preparing my mashed potatoes. And, I cooked the radish greens with some curry spice, amino acids, liquid smoke, and pepper (yum!). When the sauce was ready I plated everything and drizzled the sauce on all of it. I have to say, the corn starch did not seem to do anything as the sauce was still very liquid. I would either use more next time, or just skip it all together. 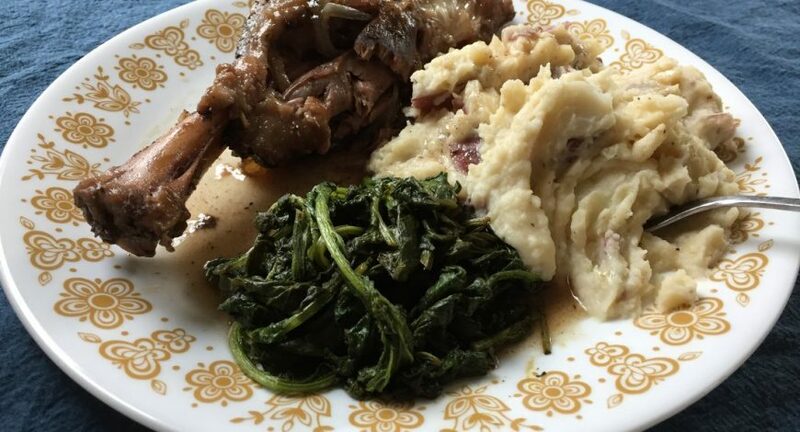 All plated up and ready to eat, here is the finished meal: lamb shanks, mashed potatoes, and cooked radish greens! I served it with some of the wine that I used in the sauce. We both really liked how tender the lamb was at it just fell off the bone. If I make this again, I will likely reduce the amount of maple syrup (gasp!). It was just a bit sweet for my taste. It did remind me a little though of one of the legends of the origin of maple syrup. The story goes that the wife of Iroquois Chief Woksis cooked their meat in maple sap one day, mistaking it for water. As it cooked, it reduced to make a syrup glaze on the meat. Maple syrup making became tradition from that day forward. I can’t be sure if the legend is true, but it was fun to imagine that I might be experiencing a similar taste when I ate the lamb. All in all, this recipe was simple and delicious and I might try it again the next time I find myself in possession of some lamb.